Creating relationships with your customers is one of the best ways to grow your business. That's why we've developed a free and easy way to stay in touch. 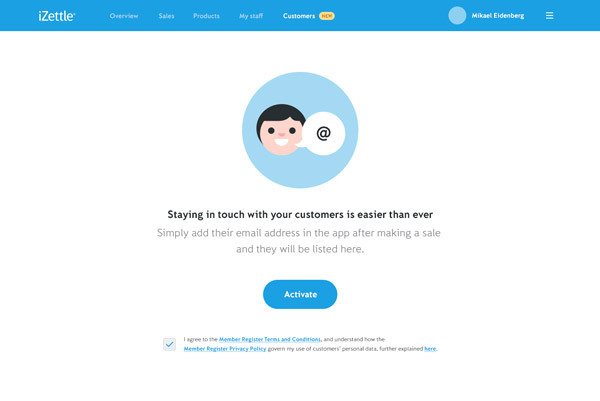 Simply add your customer's email address after making a sale, and then easily export your list of email addresses using the 'Customers' tab on my.izettle.com. After that, you can use an email marketing service to send newsletters or special offers to your customers (we like MailChimp). To enable the Customers function, you must have a business account with iZettle. If you have added Staff Accounts for your staff, they will also be able to sign customers up, but they can’t enable the Customers feature. With your customer’s permission, their email address can be shared with you. After you have completed a sale, ask your customer if they would like to receive email newsletters from you. If they agree, make sure their email address has been added and switch on “Add customer”. Next, your customer will receive an email asking them to confirm their email address. When they click “Confirm email”, their address will be added to your customer list. You can see your customer list and the number of outstanding invites on the 'Customers' tab of my.izettle.com. At any time, you can export your customer list by clicking “Export customer list”. Only customers who have confirmed their email address can be viewed and exported (not pending invites). The email address and the date it was added are included in the export. Import your list into an email marketing tool (such as MailChimp) to send newsletters to your customers. Remember that you are solely responsible for complying with applicable rules and regulations when using the Member Register Service including, for example, marketing and data protection laws.